Today, November 3, 2016, marks the one-year anniversary of my debit novel, Mystic being published. I’m proud of that book, and it’s been a real privilege to have the opportunity to talk to people all over the country (and beyond!) who’ve read and enjoyed it. Thank you for supporting me. Thank you for embracing my writing. Now, let’s talk about Mystic Dragon! When I first signed the contract for the Mystic Trilogy, the hope was for the second book to be released this month (Nov ’16). 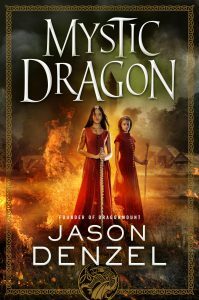 Had I hit my original deadline, and finished writing it last year like my publisher wanted me to, then you’d be holding a published Mystic Dragon in your hand right now. But that didn’t happen. And the reason it didn’t happen is that despite having an incredible publishing experience, the rest of my life took a real dive last year. Among many personal challenges, I went through a divorce and spent a great deal of time trying to re-establish a new “normal” for myself and my sons. But things are much better now, and my writing is rolling hard again. The first draft of Mystic Dragon is complete. I handed it into my editor earlier this week. She’ll read it soon and provide me with notes and requested changes. We’ll go back and forth a few times and once things look pretty good, the book will go into production and have a release date. As of today, there is no release date. [Update: the book is now scheduled for July 2018.] Not only will that give my editor time to make notes, and give me time to revise, but it will also put the book in the Fall schedule, which will give it the strongest opportunity to succeed. Nothing is planned yet, but I expect the book will be released around the same time as another highly-anticipated novel from a certain well-known author. We’ll see. I’m really excited about Mystic Dragon‘s story. 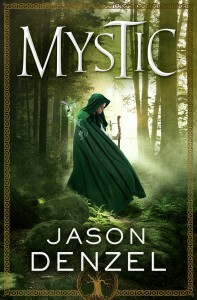 The first book, Mystic, was a light and charming adventure that featured teenage protagonists dealing with big challenges. The plot was specifically designed to be fairly straight-forward, although there were some big twists involved. My plan was always to tell a simple story in a compelling manner. I believe I achieved that, and the consensus from fans and published reviews seem to agree. Mystic Dragon takes everything to a whole new level. The characters are no longer teenagers. The challenges are bigger, the consequences more severe. The themes explored in this book are darker. This is absolutely an adult fantasy novel that pushes the whole series into unique territory. If you came to love Pomella and Sim from the first book, I think you’re going find their follow-up stories to be very surprising. This was the plan from the very beginning. Book 1 was intended to be comfortable and familiar. Book 2 blows things wide open, and the third book–which I’ve already begun and plan to finish much more quickly than the second–goes places I don’t think anybody foresaw. Seven Years have passed since Pomella AnDone became the unlikely apprentice to Mystic Grandmaster Faywong. The political balance on the island of Moth is shifting as commoners demand more rights, and Pomella is caught in the middle. When a rare celestial event approaches, Mystics from across the world gather on Moth to prevent the Mystical realm of Fayün from overtaking the mortal world. I’m especially excited for the introduction of several new characters. My early readers all agree these new people help Mystic Dragon shine even brighter than the first book in the series. So that’s the scoop. 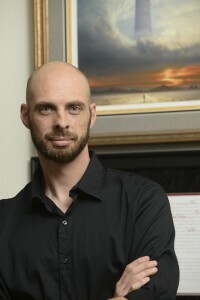 When I have more information, I’ll share it here on my website as well as on the Mystic Trilogy Facebook page. In the meantime, be sure to check out my upcoming Events, follow me on social media, and wish me luck as I dive into Mystic Skies, the 3rd and final novel in the series. Keep up the good writing! I loved your first book, very engaging! Looking forward to reading Mystic Dragon. Once I started reading Mystic, I couldn’t put it down. I read most of the book in a day. I was continuously excited to walk along with the story, and feel what was going to happen next. I fell in love with Pomella, Sim, Lal and even Vivianna. Looking forward to the trilogy, and what adventures the next journey will have for us. Finding your unveiling is an amazing journey in itself.